All The President's Men or His Master's Voice? A few days ago I was speaking to one of my guys about films that changed my life and set whatever motion I am in on the rail. I told him that the first film I was ever expected to watch, analyse and learn was All The President's Men. That was when I was doing my journalism. Actually it was one of the first films that I watched once but can tell you today what it was about. I should admit that when I went to journalism school I had heard a few things about the Watergate Scandal that hatched what is up to now the situation of the first United States President to be dogged out of the White House. In the 1970s the US was going through a lot of problems, actually it was daily moving from scandal to scandal. It was the year of the Vietnam War, when the Yankee gains were being reversed daily by the VietCong and the US embassy was classified 'high target' by the Chinese backed guerillas. 1979 spelled the overthrow of the Shah in Iran and the longest US embassy hostage drama in its history. The 19080s spelled the Iran-Contra, the US being more pre-occupied with continuing two wars lost by Portugal in Angola and Mozambique. It was a difficult year for whatever US president. The last thing the US needed in the 1970s was a Repulican led CIA spying campaign on the offices of the Democratic Party at Watergate Hotel. 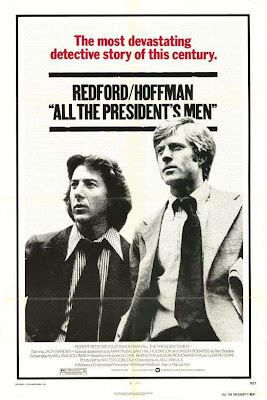 So, the film All The President's Men is borne out of that spying scandal but is explored from the part of the two Washington Post investigative reporters who uncovered the cover-up and exposed the president to the point that he was forced to resign. Not thousands of young US GIs in body bags has ever convinced a sitting president to throw in a towel, but a spying scandal at home did. The two journalists who worked tirelessly against various threats from many dangerous Washington goons ended up winning every available award there was on the media for brave men like them. In the context of South Afrika they would have won the Vodacom, Mondi Shanduka and little others including the CNN Afrika one. The two men became quite big, and no wonder in some newsrooms they still swear by them. So, for me I reckon the thrill in every journalist is in doing the right thing, chasing corruption wherever it happens, not taking bribes, not doing PR masquerading as journalism, not killing stories because they expose your friends as frauds and corrupt. I have recently heard of journalist who do water-tight stories only to send them to the corrupt people involved so that they can buy their silence. It happens quite a lot and at times I'm like, 'am I really part of such a profession that has been infiltrated by bad apples?'. When I started being a journalist was like being a doctor or a policeman. Recently all the journalists who should expose the bad deeds of the president's men, have themselves become the president's men. Shame!